Blue Highway is the latest group to join the star filled cast of performers that also include Dale Ann Bradley, Larry Cordle, Michael Cleveland, Steve gulley, Missy Raines, Don Rigsby, Jim Hurst, Gena Britt, Kenny & Amanda Smith, Justin Moses, Julie & John Pennell, Kim Fox, Mike bub and many more guests are also being added. Admission is only $20 to get to see a massive lineup of talent and the contributions go to an even better cause. There are people who are quick to volunteer their help in a time of need. A person who is always willing to help a friend or even a stranger who is in need of help. One of these people is bluegrass/country musician Phil Leadbetter, he has been helping folks throughout his life as in his earlier years he was a trained head injury rehabilitation nurse. Phil,who left the nursing field and followed his life long dream to become a musician, has backed such artists as the late Grandpa Jones and Vern Gosdin. 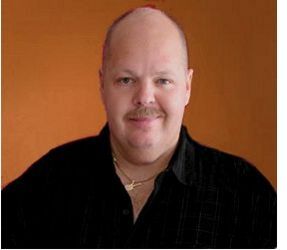 Uncle Phil, as he is affectionately known, has also been a member of J.D. Crowe & The New South, Wildfire and the group, Grasstowne and who of late was performing with The Whites,an American country music group. 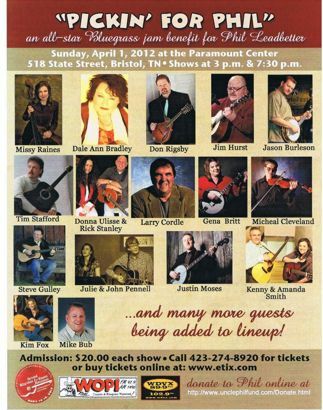 That benefit will be held at the Paramount Center in Bristol, Tennessee on April 01, 2012. There will be two shows, one at 3 PM and the other at 7:30 PM and tickets are $20.00. It will be a bluegrass all-star event and will be called "Pickin' For Phil" and will feature some of the brightest stars of bluegrass music. Members of some of the best bands in the genre who are coming together to help one of their own during this difficult time by lending their skills to this fund-raising effort. If you can't make it, please donate anyway by visiting www.UnclePhilFund.com/Donate.html.